1. Combine the white bread mix with the olive oil and 150ml tepid water, until you have a soft dough. Then, using a stand mixer fitted with a dough hook, knead the dough for about 5 minutes, until smooth and elastic (10 minutes by hand). Cover with a damp cloth and leave to rise for about 45 minutes, or until doubled in size. 2. Preheat the oven to 240°C, gas mark 8 and put 2 large baking trays in to heat up. Turn out the dough onto a floured work surface and divide into 4 equal pieces. 3. Roll out the dough as thinly as you can into 4 rounds or teardrop shapes. Dust the heated baking trays with flour or semolina and transfer the pizzette bases onto the trays. Divide the cheese and the asparagus between the bases and sprinkle over a few torn basil leaves. Drizzle with olive oil. 4. Bake for 10-12 minutes, or until the cheese is bubbling and the dough is cooked through. 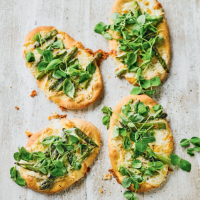 Remove from the oven and add a handful of pea shoots to each pizzette, along with another drizzle of olive oil before serving.